No payment Required until you approve the artwork! The design proof will be e-mailed in less than 24 hrs of placing the order. Brand promotion is critical for the competitive success of your business. An innovative way to achieve this is by promotional giveaways. 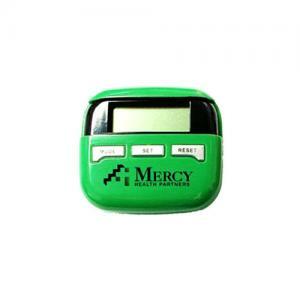 A custom solar powered pedometer is an ideal promotional gift for all reasons. This can offer multi functions for your customers. 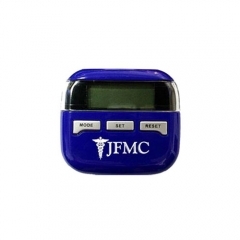 Along with counting the steps taken, the promotional solar powered multifunction pedometer can calculate the calorie, mileage and kilometer. It has an inbuilt belt clip that helps in efficient attachment. The personalized solar powered multifunction pedometer offers large imprint area to print your brand name and logo. 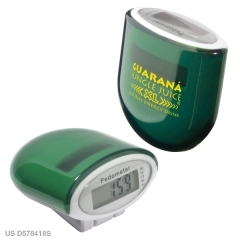 Your customers will definitely love to carry this stylish green device to achieve their fitness goal and thus your brand name gets noticed. Imprint Area : 1 1/4" x 3/8"
Product Size : 2" x 1 3/4"
Great collection, working, and affectionate prices - the list is simply large, if someone asks me to recount my personal experience with cust ompedometer.com. You guys rock! I am eagerly awaiting the next event on our health care calendar to order it from you guys again and distribute them to our eager clients.The earlier experience is good enough to cajole me to give a second try.